The Virtual Knicks Are 1-0! What Were the Knicks Doing Last Night? On Tuesday, Brian Cashman held a conference call following the announcement of his new three-year contract. He touched on a number of topics, ranging from Jorge Posada to Alex Rodriguez to how he's approaching this off-season. But one quote about A.J. Burnett stood out, even if it probably shouldn't have. Cashman was asked about the righty's role next season, and said that, "If he’s with us, without a doubt he’s in the rotation." That line, of course, hardly means that the Yankees are actively trying to move Burnett. Cashman explained at the time that he'd listen to an offer for any player without a full no-trade clause — Burnett has a limited no-trade clause — and he also noted that replacing Burnett's innings wouldn't be easy. 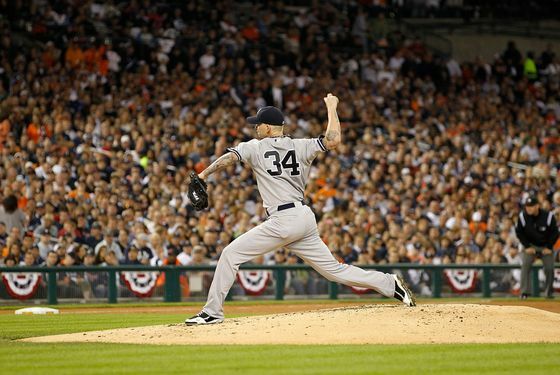 (Said Cashman: "He’s given us about 200 innings the last two years and there’s value in that, at the very least.") Still, those four words: "If he's with us." Cashman had pretty much said the same thing on Tuesday, but it probably doesn't hurt to repeat himself. (Cashman also noted that Burnett did earn the win in one of the Yankees' two playoff victories this year.) Of course, for any of this to really matter, the Yankees would need a trade partner interested in Burnett, who has two years and $33 million remaining on his contract. Cashman might be willing to take calls about a trade, but that doesn't mean other GMs have any interest in making those calls in the first place.